COMPANY PROFILE Boston Scientific Corp is a developer, manufacturer, and marketer of medical devices. The firm markets its devices to health-care professionals and institutions globally. Foreign sales account for nearly half of the firm’s total sales. Boston Scientific produces less-invasive medical devices that are inserted into the human body through small openings or cuts. It manufactures products for use in angioplasty, blood clot filtration, cardiac rhythm management, catheter-directed ultrasound imaging, upper gastrointestinal tract tests, and treatment of incontinence. The firm markets its devices to healthcare professionals and institutions globally. Foreign sales account for nearly half of the firm’s total sales. 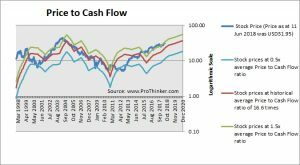 At the price of USD31.95 as at 11 Jun 2018, Boston Scientific Corp is trading at a Price to Cash Flow Ratio of 24.1 times last 12 months cash flow. 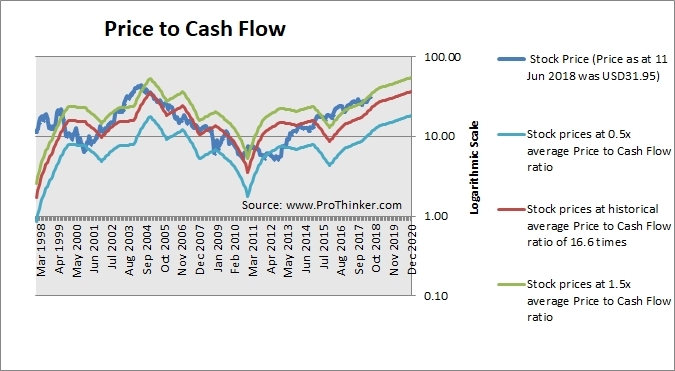 This is a 45.0% premium to its historical average Price to Cash Flow Ratio of 16.6 times.